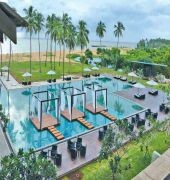 Suriya Resort is a four-star beach resort conveniently located in the popular Waikkal Beach area, close to the Indian Ocean and Ging Oya River and approximately 16km from Negombo. 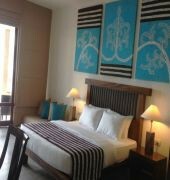 Accommodations offer convenient amenities such as a private balcony with a view of the ocean, air conditioning, satellite television, seating area, mini bar and en suite bathroom with hair dryer. 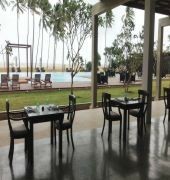 The restaurant on-site offers an immense choice of Sri Lankan and International cuisine and guest can enjoy the vast selection of cocktails and liquors served at the main pub and poolside bar. 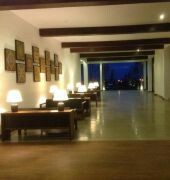 Recreational facilities include water sports, outdoor pool with Jacuzzi beds and water chalets, fully equipped fitness center and spa providing massages and beauty treatments. Additional amenities and services consist of a business center, 24 hour front desk and room service, wireless internet access in public areas, safety deposit box, car parking and currency exchange.